Gal in the Middle: Tuesday: Time to do some Hopping! Hi Love your blog! I am following your blog and would love it if you could follow mine! Fellower Middle Child here. I'm over from Tag Along Tuesday and I am your newest follower. 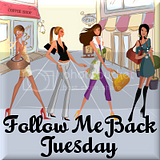 I'd love if you could follow back on any of my blogs...they could all use some follower love.